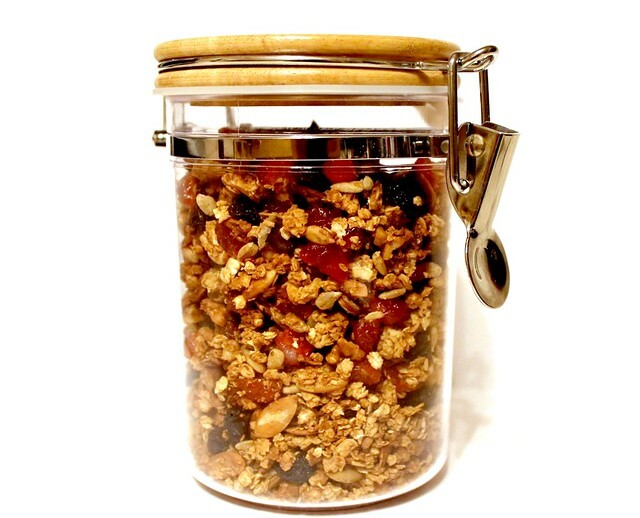 There are thousand of recipes for granola out there which seems completely right. Different people prefer different seeds and nuts, different spices, different dried berries and candied fruits, more or less oatmeal, more or less crisp. As soon as you start making it you start tweaking it here and there and sooner or later you end up with an own recipe. So I thought why not share mine as well. The more good starting recipes the better. My first inspiration came from Nigella's recipe. You do not necessarily have to have it with milk or yogurt (though both options are great). It is absolutely beautiful on it's own, dry and crunchy with a cup of good tea. Another nice opiton is to have it over apple puree, fruit compote or mix it with orange juice. Similarly, I do not limit it to breakfast. It's easily transportable to work (simply in a plalstic bag) and it is really good at calming hunger down, so it saves me as a snack between lunch and dinner or late at night. Since we started making it we keep switching between granola and chewy oatmeal cookies every week. Both are great and there is no way to choose between them once and for all. As I said, it will take you 10 minutes of mixing and 40 minutes of baking. You will have to stir it every 10 minutes to help it crisp up evenly and prevent it from burning. And you can't even imagine what kind of aroma it will fill your house with. In a small bowl mix together the applesauce, oil, honey and salt. In a large bowl mix together the oats, nuts, seeds, sugar and spices. Add the liquid ingredients and give it a good stir. The dry ingredients should get evenly coated. It will take some 3-5 minutes. Do not add raisins and cherries at this stage (they should be added after baking as they easily burn in the oven). Spread the granola evenly on a baking tray covered with foil. Do not press it down, it is better to keep it as airy as possible. Bake at 170C for around 40 minutes. Take it out every 10 minutes and give it a good stir to make sure it crisps up evenly and doesn't burn. When it's ready (it should be evenly golden) take it out of the oven. Add the raisins and cherries, mix well and let cool to room temperature. It should be stored airtight (it keeps it crisp). We use glass or plastic jars. That is it really. This looks amazing! I will try this at home.